Diane Vaugn brings us our guest post today. 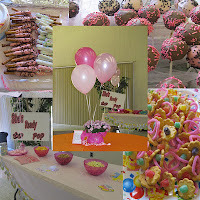 I had an amazing time at our Ready To Pop Baby Shower. A shower is not just a time to get presents anymore. It is a time to celebrate new life. A time to strengthen the relationships that you have before the chaos begins. Take it away Diane! Every spring it seems I get a flurry of baby shower invitations and usually at least one request for me to help plan or decorate for a shower in my extended family or circle of friends. Babies just seem to be appearing like spring flowers in my circles. With the invitations, I always get to thinking about what new baby shower trends I’ll see pop up in the coming year. This year, we’re looking at some continuing trends that I’m really excited about, and some that people should probably be thinking carefully about if they want them to go smoothly. More and more people are taking advantage of parks, backyards, gardens and other lovely landscapes to host their shower, especially when it’s a larger gathering. Depending on your climate and shower date, I really recommend using nature as the backdrop to celebrate your impending parenthood. Natural settings evoke a sense of renewal, new beginnings and an abundance of life—all good themes for a baby shower. Just a caution if you do decide on an outdoor gathering: the weather can ruin even the best laid plans, so it’s best to have an alternate venue to shelter from the elements. There’s nothing wrong with wanting all your friends and family gathered to celebrate your happy news. But as with trends in smaller, more intimate weddings, small-scale baby showers are also seeing a rise in popularity. I really do like this trend for several reasons. You can couple a small shower with a larger event like a Sip and See, so everyone who wants to still gets to drop by with best wishes and to see the little one. But the smaller gathering is less overwhelming for a Mommy-to-Be who’s already under a lot of stress. I’m a little hesitant to endorse this trend, both because there are valid concerns about over-sharing, and there’s definitely a right and wrong way to share something as personal as an ultrasound. But there is a gender-reveal element to ultrasound baby showers, which I don’t think is over-sharing and is particularly moving and celebratory. I think one thing planners may overlook here is that the ultrasound at the shower should never be the mother’s first ultrasound. Heartbreaking medical revelations can happen during an ultrasound, and that is definitely something that should not be shared, or at least not revealed in front of an audience of even your closest friends and family. Get a regularly scheduled sonogram first, and then do the gender reveal at the actual shower. I’ve usually been to showers that include the Daddy-to-Be and friends as guests. But let’s be honest, baby showers are largely a Mommy-centric event, and I think a separate celebration specifically for the Dad is in order. This is a good trend that’s time has come, I think. It just needs to mature a little more in the area of planning and execution. A simple night out with the guys is often what a manshower amounts to, but I really think Daddy-to-Be and his pals deserve something a little more involved. Set them up with a big spread of game-day appetizers, drinks and entertainment. I think we’ll see plenty of interest in these new trends over 2013 for baby showers around the country. I’m also keeping an eye out for truly creative ideas that will become sleeper hits for the year. Is there a baby shower in your future in the next few months? Got any creative ideas you can let the rest of us in on? Diane Vaugn is an event planner who also writes for BabyShowerStuff.com, where you can find everything you need to plan a gorgeous and effortless baby shower. When she isn’t writing, baking, planning a party or intimate gathering, you’ll probably find her at a piano recital somewhere.